Banks are among our most enduring of financial institutions. Their survival in so many different historical periods is testimony to their importance. Professor Shiller traces the origins of interest rates from Sumeria in 2000 BC, to ancient Greece and Rome, up to the Song Dynasty in China between the 10th and the 12th century. Subsequently, he looks at banking in Italy during the Renaissance and at the goldsmith bankers in 16th and 17th century England. Banks have survived so long because they solve adverse selection and moral hazard problems. Additionally, he covers Douglas Diamond’s and Philip Dybvig’s model, which does not only analyze the banks’ role for liquidity provision, but also reveals the possibility of bank runs. This leads Professor Shiller to deposit insurance as a means to prevent bank runs. He discusses the Federal Deposit Insurance Corporation as well as the Federal Savings and Loans Insurance Corporation, together with the role that the latter played during the savings and loan crisis of the 1980s. The necessity to regulate banks in the presence of deposit insurance results in a discussion of the role of the Basel commission and an explicit calculation to illustrate the core principles of Basel III. At the end, Professor Shiller provides an overview of financial crises since the beginning of the 1990s, with the Mexican crisis of 1994-1995, and the Asian crisis of 1997. Professor Robert Shiller: OK. So, today we’re going to talk about banks, banking. Before I start, I wanted just to remind you that we have Hank Greenberg coming on Wednesday [addition: next lecture]. And we talked about him in a previous lecture, but he is one of the most important capitalists, I think, in the world. The firm, AIG, which was started by C.V. Starr, was converted into the biggest insurance company in the world by Hank Greenberg. Over many years, the two of them ran AIG exclusively, first Starr and then Greenberg. And Greenberg produced a very innovative insurance giant. It didn’t end well, but I think he–I talked to him the other day. He said he’s going to talk about the end, what he learned from the experience. Once again, no one can control everything that happens. And random shocks affect all of our lives. He remains a very important–he’s no longer at AIG–remains a very important force in our society. Now, he’s very much involved with philanthropy and doing things like lecturing young people, which he freely does out of a sense of commitment. So, I think he’s a committed person that has a moral purpose, that’s why I asked him to be one of our lecturers. But today we’re talking about banks. And I wanted to–the outline my lecture: I’m going to start with the origins of banks, thousands of years ago. Then, I’ll talk about the theory of banks, fractional reserves and deposit insurance. Then, bank regulation, particularly in light of the world financial crisis, which has changed the nature of regulation. Changes that will be with us for decades to come. I talk about shadow banking, which is the new banking sector that emerged and escaped regulation until the crisis. And then, I’ll talk at the end a little bit about comparison of financial crises in the past in various places around the world, to see how banks managed in those crises. So, the first thing I want to say is, this is a lecture about banks, OK, and that means traditional banks who take deposits and lend money. It’s not about investment banks. That’s another lecture. An investment bank, a pure investment bank, does not accept deposits. And its most characteristic thing is underwriting of securities. So, that’s a different lecture. And I’m not talking about central banks in this lecture. That’s also–well, the lecture on monetary policy. Central banks are the government organizations that manage the money supply of a country. So, we’re talking here about banks, and I thought I should start out by defining a bank. The word bank, by the way, means counter or tabletop where bankers used to do their business. That’s the English word that emerged in the 15th century. But banks, of course, precede that with other names. What is it that is the characteristic activity of banks? I would say, maybe the most characteristic thing is that banks earn spread income. That is, they borrow at a lower interest rate, and lend it out at a higher interest rate, and they make the difference. Your deposit rate is lower than the rate at which they charge for the loans they make. So that’s the spread income or margin. So, that might be considered the core idea of a bank, that you borrow at a lower rate than you lend. But I’m not sure that that summarizes it, either. There’s other aspects of banks that we’ll talk about. Another aspect of banks, traditionally, has been note issue. That is, they print paper money, and then it circulates and goes–you have some of these in your pocket. They’re currency. If you stopped a person on the street a couple hundred years ago, and said, what is the essence of a bank? I suspect, the first thing they would say is, oh, they print money. And that’s the paper money that we use. But you don’t think of it this way. Probably not, because most of that function all over the world has been shifted to the government banks, the central banks, in the various countries. And so, you don’t think of private banks as issuing bank notes. But they used to and it used to be prominent. The private bank issuing of notes today in the world, I believe, is concentrated primarily in two countries. One of them is the United Kingdom, and the other one is Hong Kong. Tell me if there’s another country. I don’t know who else does it. In the United Kingdom there are eight banks that still print pound sterling notes. And they’re not very prominent. In Scotland, there are some. I actually once went through the Chunnel from England to Scotland, oh, from Scotland to France [correction: from England to France], and I tried to spend my Scottish sterling notes on the train, and the guy, who was French-speaking, stared at it and said, what’s this? And he wouldn’t take it. So I said, this is pound sterling. This is official. It trades at par with the Bank of England notes. Hong Kong has three banks that issue their bank notes. Let’s see, Hong Kong Shanghai Bank [correction: Banking] Corporation, Standard Charter [correction: Chartered] Bank, and the Bank of China, Hong Kong. Everywhere else, banks don’t issue notes. And the reason they don’t is, laws have been made to prevent them, because these notes lost value so many times in financial crises that governments said, it’s not something that we’ll allow private banks to do. So, it’s generally gone. If you look at your $1 bills in your pocket, it will give the name of a Federal Reserve bank. And there’s 12 of them. Our Federal Reserve bank here is the Federal Reserve Bank of Boston. So, you can look at your dollar bills and see which bank issued it. So, you’re probably carrying a lot of Boston money, but since it’s all the government, you know, you don’t even notice that, right? You don’t notice. If this were 1750, and you had Boston money in your pocket, you might–because we’re in Connecticut–you might have a problem. You’d have to go to a money dealer and have it exchanged, because they didn’t know or trust the Boston bank. That’s all past. So, note issue is a matter of history. So, there’s other aspects of a bank I want to emphasize. One is liquidity. And this is essential element of banking as well, and I’ll come back to that when we talk about theory in a minute. But banks offer liquidity by borrowing short and lending long. This is different from spread income. I’m saying the interest rate is lower on the borrowing of the bank than the lending of the bank. There’s another discrepancy. The maturity is longer on the lending of the bank than the borrowing of the bank. So, banks are providers of liquidity. That means, a business wants to borrow money, or let’s say a homeowner wants to borrow money to buy a home. Right? Let’s take that example. That’s more familiar. You’re going to lock up the money for maybe 30 years. You don’t want to pay the loan back tomorrow. What if the lender says, I need the money, give it back. You can’t give it back, or you don’t want to give it back. So, what a bank does is, it takes deposits and allows people to cash them in whenever they want. It lends the money out long on 30-year, or so, loans. So, it generates liquidity. The borrower has what he or she wants, which is a 30-year loan. The lender has what they want. They have an account they can get at any time. And so this is an important function of banks. But the problem with it is, that there’s a problem of crises. Because if everybody asks to pull their money out at once, they can’t do it. The banks, in normal circumstances, generate liquidity, but they create a system that’s vulnerable. And so, the banking industry has been plagued by frequent crises throughout history. So, I wanted to say something about the very beginnings of banking. Who did it first? By the way, I should have written the words interest rate. When I’m talking about spread income or margin, I’m talking about the difference between two interest rates. But more primitive is the idea of interest rate. So, where did that idea come from? Well, I was reading some economic historians. Apparently, the word interest first appeared in the Sumerian language. I guess the oldest records are about 2000 B.C. And they had a word which they write as mas. I guess, that’s pronounced mosh, which was their word for interest, but it also means lamb. And so, one historian was wondering, why do the Sumerians use the same word for interest as they do for an animal, a lamb. And he thought that maybe it was because the idea of lending money at interest grew out of an earlier idea of renting land. So, you would have land that you weren’t using in ancient Sumeria, and you would rent it out to somebody who would then use it. And one of the things that the person would do with it, is raise livestock, raise sheep, on the land. So, you would say, well, I need some produce from the land to compensate me for letting you use it. So the guy would say, fine, I’ll give you all the offspring of our sheep, the lambs. That was an old tradition in Sumeria. So, they thought it’s basically the same thing. It’s like giving over the lambs. If I lend you money, I’m giving you productive resources, and it’s going to produce something. We’ll call it lambs. And I want that. And you’re compensating me for it. So, that’s where the idea began. And so, you’ll find it in the ancient world, in the near, non-oriental ancient world. In ancient Greece and Rome, interest was well established. And some kind of banking. Now, I don’t know whether there were bankers in Sumeria, but there probably were, because all it takes is that you do both sides. They actually didn’t necessarily lend money in those days. They would lend barley or wheat, and they would charge interest in terms of wheat. You don’t need money to do banking. But I suspect that somebody in ancient Sumeria was doing both sides. He was borrowing wheat, and lending it, and earning a spread income. And so, there must have been banking in the world. But anyway, what about these kinds of institutions that we call banks? Oh also, the first–apparently, if I’ve got my history right, the first record of interest rates in China was Song Dynasty. And that was from the year 960 to 1279. They were, at that point, inventing paper money and other financial institutions. I don’t know if they had institutions called banks. But, you know, it often would be a family business lending money. If you were a prominent family, you would often take other people’s money for safekeeping. And it was also connected with religious temples in the past. But the modern banks seem to appear in Italy in Renaissance times, where they actually had a banking institution. And that’s where the oldest bank in the world today exists. It’s Banca Monte dei Paschi, in Siena. And that means the bank of the mountain of sheep. [Correction: Mountain of Pastures] It’s the same analogy, I guess. I don’t know if they called their interest lambs. And so, that bank was set up in 1472. That’s the oldest surviving bank in the world. I went there. You can go there if you visit Siena, and they have a little museum on the first floor near the lobby. And it’s actually the third largest bank in Italy. A very old institution. It’s interesting that this bank, which was founded in 1472, was founded as a philanthropic institution to lend money to the poor. And wealthy donors in Italy gave money to set up this bank. It goes beyond that now. It’s not just lending to the poor. The other thing is in the 1600’s, they gave it deposit insurance. Believe it or not. The Duke of Siena said he would guarantee all deposits. So, deposit insurance appears to have been invented in Italy as well. But a lot of people emphasize, when they talk about the history of banking–I was reading, in preparing for this, economic histories to see what they would say about banking. And professor Clive Day, a professor here at Yale, wrote a book called, History of Commerce, in 1907. You can pick up his book, if you want to, on Google Books. It’s past its copyright. I had great fun reading it. He’s long gone, professor at Yale. But his history begins in England, with the so-called goldsmith bankers. What happened was, in England in the maybe 1500’s or 1600’s, somewhere around that, goldsmiths who made gold jewelry had safes or good places to store gold. And so, people would go to the goldsmith, and maybe they’re having jewelry made, but then they’d say, could you keep some of my gold in your vault? And so, the goldsmith banker would say, all right, I’ll do that. And I’ll give you a note saying, I’ll promise to pay you this amount of gold that’s in my vault. So, sometime when you were out shopping, the goldsmith banker’s note would be in your pocket still, and you’d want to buy something. So you’d say, well, I’ve got this–you talk to the merchant and you say, I’ve got this gold. It’s in the goldsmith. I’ve got his note here. So the merchant would say, all right, I’ll take that, but you got to endorse it over to me. Write a note on the note saying that this thing is being transferred to me. And so, I can go to the goldsmith and get it out. That’s how paper money got started in England. It started to circulate with many endorsements on it. And then finally, the goldsmith said, let’s forget about endorsing it to one person. Let’s just say, to the bearer. And so, paper money started developing kind of spontaneously. And then, the goldsmiths noticed, you know, they’ve got all this gold in their vault, they can lend it out. Why not? Because nobody ever comes and asks for it, now that these paper notes are circulating. Nobody asks for it, so I’ll start lending it out. And they didn’t have to pay any interest on the notes, because people would hold them anyway just because they valued the safekeeping. I guess they were paying interest in the sense that they were providing the safekeeping. So, that’s how banking got started in England, but it was really preceded in Italy. What has happened is, because of repeated problems in the banking industry, which gradually grew through time into something that’s more and more important, governments all over the world regulate them. And that means they define certain specific types of banks that differ a little bit from one country to another. And you have to–when you decide to create a bank–you have to decide which type you are. So, I wanted to start–and in your textbook, Fabozzi, talks a lot about types of banks. But let me just talk about the major types. I’ll talk in the U.S. The most important type of bank is called a commercial bank. And these are banks that take deposits. You can put your money in the bank, and then it will pay you interest, and it will also make loans of various kinds. But, most characteristically, business loans. Commercial banks were even more prominent 100 or 200 years ago, because they didn’t do mortgages and consumer loans. It was all business loans, initially. So, this is kind of the historic important kind of bank. And in 2010, the total assets of U.S.-located, commercial banks was 14.6 trillion. But actually, a lot of that was foreign commercial banks operating in the United States. Of that 14.6 trillion, only 10.1 was U.S.-chartered banks. So, bankers operate all over the world. So, we have banks like, I mentioned Hong Kong and Shanghai Bank [correction: Banking] Corporation, or the various Swiss banks that have big operations, or Deutsche Bank, big operations in the United States. So, they account for almost a third of our commercial banks. But then, there are other kinds of banks, and they’re smaller in terms of–this is assets of the banks. It’s not their market cap. Market cap would be much lower, because remember offsetting these assets are liabilities they owe to the depositors. But there’s other kinds of banks. There are savings banks. In the U.S., savings banks had only 1.2 trillion. These savings banks tend to be old institutions that have grown very large over time. They’re the result of a savings bank movement in the 19th century, which was a philanthropic movement to set up banks for lower-income people. Because commercial banks traditionally wouldn’t take deposits from small–you’d have to have a minimum size. They didn’t deal with ordinary people. So, they created savings banks to encourage thrift and saving. Actually, it follows on a U.K. movement, a savings bank movement in the U.K. And they’re still with us, but they’re not so big. And there’s also credit unions. That’s another social movement. And they’re only 0.9 trillion, or about 900 billion in assets. Credit unions are basically clubs of people that belong together in some group. If you have a company, you can set up a credit union for the employees of your company. Both savings banks and credit unions make a lot of mortgage loans. That’s kind of their characteristic business. In U.K., you have the same kinds of banks. The savings banks would be called building societies, but it’s the same idea. They make loans for buildings. So, I said I would talk about the theory of banks. I’ve already given you some indication by describing what is it that banks do. But I see I have a lot more to talk about. I have to consider my time here. There’s so much to say about banks. It’s a whole fascinating subject. But I wanted to mention, the theory of banks was laid out in the Diamond-Dybvig model in the Journal of Political Economy, 1988. They were both colleagues of ours at Yale. They’ve moved on. So, I know them both. Doug Diamond and Phil Dybvig. But what they described is a model–I’m not going to give you the model, just to tell you about it–the theoretical model of banks as providers of liquidity. That liquidity is an economic good that you can somehow get for nothing. It’s just like portfolio diversification. We don’t need to expend any resources to get diversification, we just have to manage our portfolios right. Similarly, you set up a bank, and lo and behold, liquidity appears. And it makes it possible for people to live their lives better. I mentioned that you can live in a house for 30 years, or you can move whenever you want. But the problem with this is that there are multiple equilibria. Their model has a good equilibrium and a bad equilibrium, and it depends on expectations. If people think that the banking system is sound and it’s going to work well, it works splendidly. But the problem is, all it takes is for people to suddenly change their expectations, and then it all falls apart because you have a run. You have a bank run. So, what Diamond and Dybvig did is to provide an economic rationale for deposit insurance. Insuring deposits against default of the bank helps prevent bad outcomes, keeps us in the right equilibrium. So, this is an important paper. The problem is that banks runs can be triggered by random shocks to the model. And so, what happened in the latest crisis is, there was a real estate bubble. It’s not something that’s represented in Diamond and Dybvig. And the bubble, when it burst, when home prices started falling, and commercial real estate prices started falling, the banking system started to fall apart. So, it’s not entirely easy to keep banks under good control. You see, Diamond and Dybvig emphasized that banks are an invention that creates liquidity. And liquidity is a positive economic good that makes us run our lives better. So, it’s an important invention in the history of economics. But there’s other issues that banks do, problems they solve. One of them is an adverse selection problem that plagues securities. I didn’t mention the alternative to banks for raising money, if you’re a business, is, that you could issue bonds or commercial paper. You can borrow money directly from the public without an intermediary, OK? They do this. I’m a company. I need money to, say, build a new factory. I go not to a commercial bank. I go to an investment bank, and they help me issue some paper to the public. And we sell it off in some market. The problem with issuing debt directly to the public is, that the public can’t judge the quality of the company easily. Most people who are investors are not good at estimating the value, the security of a company. So, they need some kind of experts. If the adverse selection would happen, see, the experts, the people who know, would buy all the good stuff, and it would leave beyond–people would start to think, I’m not going to buy these securities, because why are they being offered to me? I don’t know anything. I’m a sucker. That’s the idea. I’m not a sucker, I just don’t know. I may be smart, but I just don’t know what the quality of this company is. If I just go in there blindly and pick up whatever seems to be out there, I’m going to suffer an adverse selection. I’m going to get the worst stuff, because I’m not looking–I can’t look, they’re going to dump the bad paper on me. So, banks solve that by being in the community, knowing who is borrowing, and having a reputation, so that instead of you suffering this adverse selection problem, the bank has people who know what’s going on. So, the thing about banks is they have local loan officers who serve in a particular community. And they know all about that community. And they solve the adverse selection problem. So, for example, if you are a loan officer in a bank, by tradition, you are someone who gets involved in the community. You’ll find them on the program at the symphony. They’re one of the donors. They show up for all kinds of things. They know what’s going on. They play golf with local business people. They hear the gossip. So, someone says, you know, this guy, the CEO of this company, I think he’s an alcoholic. You better watch this guy; I don’t know what he’s doing. You hear these things. And you know what happens? The guy doesn’t get a loan the next day. I hate to say it, but they kind of vouch for the character of people. I mentioned this in a previous lecture, that there’s all kinds of people out there. And you can’t prove or judge who’s good. You can’t write it down in some objective way, who’s going to be a responsible business person. But banks know that, so they solve the adverse selection problem. There’s also a moral hazard problem that banks solve. The moral hazard is that a company may borrow money, and then take a big flyer and do some wild investment. Let’s take this, for example: suppose we owned a small company and it’s not doing well. We have this great idea. Let’s borrow $10 million, and let’s go to the racetrack and let’s put it all on the least likely horse to win, all right. And, you know, our chance of winning is only one of 10, but if we win, I got $100 million, OK? If we lose then, hey, we just go bankrupt. We say, sorry. Of course, you really couldn’t do it at the racetrack. I mean you’d be sued if you did that. But you see what I’m saying. I could see–I wouldn’t do that–but I could see wanting to do that, right? Your company’s going out of business anyway, you know, you don’t have any prospects. But if we can borrow $10 million, go and bet it on the racetrack, and one in ten we’ll be super rich. We’ll have $90 million, right? Pay off the debtors. Everything’s fine. They won’t complain if you win. They’ll complain if you lose, but then you say, sorry, you know, we’re out of business. It’s limited liability. So, what banks do is, they help solve this problem by constant monitoring, and they make commercial loans that are at effectively long-term, but in practice, officially short-term. They keep renewing them, and they can cut you off, when they think you’re doing something that reflects moral hazard. So, the constant monitoring that banks provide solves the moral hazard problem, just as their information collection solves the adverse selection problem. I’m just trying to see, where I want to go next. So, I mentioned deposit insurance. I mentioned that it started in Italy in the 1600’s, but it has a long history of governments backing up deposits of banks in order to prevent banks runs. Because bank runs happened too often. People would get a little scared, and they would go to the back and try to pull all their money out. They’d hear a rumor, and then the whole banking system could collapse. People in various governments at various times offered guarantees. But the problem is, those guarantees can get really expensive. So sometimes, they had a limited guarantee, and so sometimes, the deposit insurance scheme would fail. And so, the history of deposit insurance is a checkered one. So, in the United States there were various state governments, local governments, that created deposit insurance schemes before the FDIC, but a lot of them failed, and so, people said this is a crazy idea. But the United States government in 19, I think it was ‘33, do I have this right? [1933 is correct.] Created–I think that’s right–the Federal Deposit Insurance Corporation as part of the New Deal under Franklin Delano Roosevelt. And it has never failed to this date. Why didn’t it fail? It’s hard to know, exactly. We never had a big back run since 1933. It seemed to create the psychology that people stopped worrying about bank failures, because they believed they were insured. I guess they believed Franklin Delano Roosevelt. And so, if you believe it, then it’s one of those funny things, it’s the multiple equilibria that Diamond-Dybvig mentioned. As long as people believe the bank system is sound, it is sound. We also created later, another deposit insurance, called the Federal Savings and Loan Insurance Corporation [addition: abbreviated FSLIC], that was doing the savings and loan associations, which were a type of savings bank. And that did fail. And so, we had a huge crisis in the United States, called the saving and loan crisis, in the 1980’s. So, the S&L crisis in the 1980’s was due to a widespread failure of saving and loan associations, and then, kind of a run on the saving and loan, but it wasn’t really a run, because the FSLIC was trusted. And what ended up happening is, the FSLIC had reserves against a certain amount of losses from the banks, but they went through them completely. And then they were bankrupt. So, the insurer went bankrupt. What then happened is, the United States government picked up the tab. And the total tab was $150 billion. And that restored confidence. I guess the government had to do that. And the FSLIC no longer exists. Savings and loans are now insured by the Federal Deposit Insurance Corporation. So, you know, these institutions really don’t necessarily represent the real insurance. You have to always see beyond institutions. The FSLIC was encouraging people to believe in the security of the banking system, but it really wasn’t the ultimate security. The ultimate security wasn’t even written down. It was the recognition by the U.S. government, that if we let FSLIC fail, and we let all these depositors in the savings and loans lose their money, it’s going to destroy the confidence that has kept us away from bank runs. And the next thing, commercial banks, or who knows, what else will happen. So what always happens is, the government stands behind these promises, even if they weren’t made so clearly. There’s another example, I’ll give you, which is more recent, of a bank run. And that occurred in United Kingdom in 2007. The bank was called Northern Rock. And a rumor started–this was at the beginning of the financial crisis–a rumor started that Northern Rock held a lot of subprime securities, and was going to go bankrupt. So, people rushed to Northern Rock, and big lines formed outside of Northern Rock. People, they wanted to get there first, because you thought, they’re still handing out the money. I want to be there first. And then, newspaper photographers photographed the crowd outside the bank, and people thought, well, this is just like 1933 and the huge banking crisis. Now, actually, the U.K. government did have deposit insurance, but the deposit insurance in the U.K. would insure fully all deposits up to GBP 3,000. And then, it gave 90% insurance up to GBP 75,000. After that, you were out of luck, OK? So, why was there a bank run on Northern Rock when there was deposit insurance? Well, I tell you. It was people who had more than GBP 3,000 in the bank, very simple. And so, you know, they didn’t really have enough deposit insurance to stop a run. So Mervyn King, who’s head of the Bank of England, just decided, you know what, we’ll bail everybody out. No questions. Forget our deposit insurance scheme. And that stopped the run. So again, it happened the same way in the United Kingdom. The deposit insurance stopped it, before it was any problem. So, the United Kingdom has never had a bank run failure since 1866. It’s not really because of any deposit insurance scheme. It’s about the Bank of England, which is their central bank, and what it does to maintain confidence. Other countries handle it differently. I was going to mention, in Germany, IKB Deutsche Industriebank, OK, in 2007. This is a German bank that German depositors put their money in. And it had invested a lot in subprime securities. And it was in trouble, and there were starting to be worries of a run on them. The German government didn’t even wait for a bank run. They just bailed them out, and it cost them EUR 1.5 billion. But again, the governments know that they want to maintain confidence, and so they do it. They do what they have to do. Now, I want to go to bank regulation, more generally. If you are insuring banks, then you’d better regulate them, because there’s a moral hazard problem. I just described a moral hazard problem for a company that borrows money from a bank, but there’s moral hazard problems for banks as well. Namely, banks can do the same trick. I said, go to the racetrack. Borrow money and go to the racetrack. Banks can do that, same thing. Except, they wouldn’t actually go to the racetrack. They would pick some really risky business venture. And if it fails, then it all falls to the deposit insurer. This is a fundamental lesson of insurance, whenever you insure something, you’ve got to regulate the person insured. Because once you’ve taken a risk from their shoulders, you create moral hazard for them. And so, bank regulation is very important. So, I was going to talk mostly here about the kind of bank regulation that has an international dimension. And so, what I wanted to talk about is the Basel bank regulations that were generated by international organization in Basel, Switzerland. After the saving and loan crisis was Basel I. Was an international meeting that published a set of recommendations for all the countries of the world to regulate their banks. The idea was that there should be some coherence across countries. If one country regulates its bank very stiffly, that’s going to drive business out of that country and into other countries. Also, there should be some standardization. It helps the world economy, if everybody knows that all the banks of the world have similar regulations. But Basel, the Basel Committee, as it’s called, that created the recommendations, had no legal authority. All it could do is recommend. But it did recommend bank regulations, and these were widely adopted around the world. Each country could make modifications, whatever they want. You can’t order countries around, but they often followed the Basel recommendation. In Basel II, they met again in the 2000’s, and they issued recommendations in 2004. What they said in Basel II was, the banking system was getting so much more complicated that they had to think more about how to do it. Now, there’s all these complicated derivatives and special purpose vehicles, and so they had to update their regulation. Unfortunately, Basel II has suffered a reputation blow, because right after Basel II we had the world financial crisis. So, they didn’t do something right. They didn’t really fix the system in Basel II. So, that brought us to Basel III, which is the latest version. And they issued their report in 2010. And also in 2010, the G-20 nations meeting in Seoul, Korea, expressed their support for Basel III. So, Basel III is the current world regulation standard. But it’s phased in gradually, and it won’t be fully phased in until 2019. They didn’t want to put it in all at once, because the world is in a financial crisis, and it would be too stressful. So, it has a slow phase-in. And some of the details haven’t even been worked out yet. The G-20 countries have agreed, in principle, that these regulations are where we’ll go, but details have yet to be worked out. You know, bank regulation is a big business. We could have a whole semester on studying what these guys do. So, I just wanted to give you kind of a caricature of what’s in Basel. It’s also in Fabozzi, the Fabozzi textbook, which is copyright 2010. You’d think this would be in it, but it’s not. Basel I and Basel II are in Fabozzi et al. Basel III isn’t, because it didn’t come in until the end of 2010, and so it didn’t make it in time to appear in your book. But I wanted to just give you a simple account of all the Basel agreements, and some sense of where we are with Basel III. They’re all about banks having enough money. You know, not taking on too much. Enough money for the risks they take. Let me start with Basel I, because part of Basel I is enforced in all three of them. And there’s a concept called ”risk-weighted assets,” which is in Basel I, and Basel II and Basel III, essentially the same. OK, so, here’s the idea. We’re going to put capital requirements based on risk-weighted asset. What does that mean? That means, that banks cannot take too many risks. They have to have enough money to back them up for the risks they take. And we’ll call that money capital. It’s not money. It’s not cash, but it’s assets that they can use to get them out of trouble, if the risky assets do badly. So, if we’re going to have a requirement on how much capital a bank holds, we have also to define their risks. And so, Basel I had a very simple formula to compute risk-weighted assets. Well, it’s very simple, until you get into all the details. And so, you’ll see the definition of risk-weighted assets. It’s in table 3.3 in Fabozzi. But basically, here it is. There’s four categories of assets. The 0% weight, the 20% weight, the 50% weight, and the 100% weight. The higher the weight, it means more risky, OK? So, where will I write these? I’ll do it up here. Now, we’re talking about all three, Basel I, II, and III. 0% are national–well, I’ll say OECD government bonds, national government bonds. The OECD is the Organization for European Cooperation and Development. And they represent advanced, stable European countries. And U.S. government bonds are included among them. What else, OK? Yes, basically that’s it. Now, there might be something else in there, and I’m sure there is, but this is the simplest. 0% weight, because these have 0% risk. There’s no risk, OK? So, banks can hold all they want of these and they don’t have to hold any capital. Then, next up is 20% weight, and that’s municipal bonds, or local bonds, that’s not issued by the national governments but issued by a city or a state. We’re having a municipal bond crisis now. They’re suddenly showing their risk, and we’re worried about defaults on them, so Basel I was right to give them some weight. They gave them a 20% weight, because they thought, municipal bonds are pretty safe. They’re not as safe as national government bonds, because there’s examples of default. But they also included, there’s a long list of what they include, but notably Fannie and Freddie–these are the two mortgage lenders in the United States–were included for 20% weights. Because people thought, these guys are really safe, and anyway, the U.S. government backs them up. Although the U.S. government said, it wouldn’t back them up. But you know, we all know, they’re going to back them up, and indeed, they did back them up when they failed. But Fannie and Freddie, prior to the crisis, started increasingly investing in subprime mortgages. And they were issuing subprime mortgage securities that were really very risky and eventually went kaput. Basel I didn’t know that, or Basel II and Basel III still, they just gave them a 20% weight. There’s a big mistake, that’s where probably part of the banking crisis comes. Then, there’s 50% weight, and that’s for mortgages, home mortgages. The Basel people thought, there could be some big real estate crisis. You know, it’s something to worry about, so there’s more weight than that. And then, we have 100% on everything else, but notably loans, like commercial loans to businesses, all right? So, those are the weights. And so, I just wanted to go through a simple example. Suppose you are a bank, and you have $400 million in assets on your balance sheet, OK? These are things that you as a bank own. And let’s say you have 100 in government bonds, federal government bonds. 100 in Fannie Mae, 100 million. And you have 100 in mortgages that you own directly. And you have 100 in commercial loans. So, your total assets are 400 million. But you’ve got to know what your risk-weighted assets are. What are your risk-weighted assets? Well I take the 100–Fabozzi goes through an example too, but this is very easy–I multiply the 100 by 0, I get 0. I multiply this 100 by 20%, so that gives me 20 million, right? I multiply the mortgages by 50%, it gives me 50 million, and I’ve got to throw all these in. So, what does that add up to? It’s 170 million RWA, risk-weighted assets, right? It’s 0 plus 20, plus 50, plus 100, all right? So, those are my risk-weighted assets, and then, the amount of capital that I have to hold is a percentage of the risk-weighted assets. I could go through Basel I, Basel II, Basel III; they kept changing these percentages, as they went along. So, I’m just going to talk about Basel III, because that’s going forward, all right? And Basel III is complicated, too. I’m going to just talk to you about common equity requirements. So, Basel III says–it’s an interesting and creative construct–common equity must be 4.5% of RWA at all times. But I’ll add to that. They have plus 2.5%, what they call a capital conservation buffer. And so, that adds up to you 7%, I’ll explain. You absolutely have to have 4.5% as common equity, but if you don’t also have another 2.5%, you can’t pay out any dividends. That’s not so good. So, in reality, you better keep 7%. So effectively, Basel III–this is Basel III, it’s not in your textbook, but it’s coming all over the world, 7%, OK? Now incidentally, the interesting thing about Basel III, they’re thinking creatively, they added another buffer, called a countercyclical buffer. Well, that’s not added automatically. And that’s another 2.5%, but only if the regulators in the country choose to impose it. And here’s the idea: We have to stop bubbles before they burst, right? So, suppose you think that a bubble is building up in your country, then the regulators are asked by Basel, if they make that judgment, to add another 2.5% to the capital requirement, while it’s booming. You don’t wait until the crisis to do this, because then they’ll all be in trouble, and if you tighten up on banks then, they’ll stop making loans, and will crash the whole economy. You have got to tighten up when times are good. So, that adds up to 9.5%, OK? So, you’d have to hold capital equal to 9.5% of your risk-weighted assets. But presumably, the normal number is 7%, OK? So, let me just go through for this bank here, which has $400 million in assets. What is their requirement? Well, we figured out that they have 170 million in risk-weighted assets. Multiply that by 7%, and that gives you, I think it’s $11.9 million that they have, right? So, your common equity must be 11.9 million. Student: It’s common equity plus the first buffer, right? 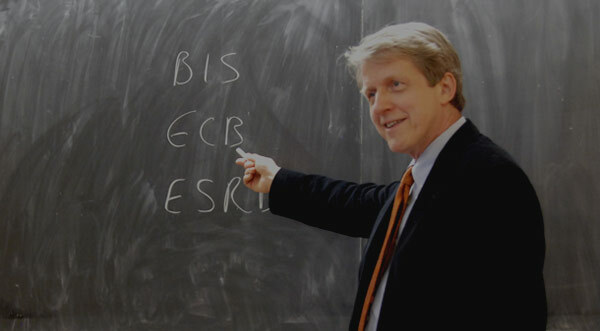 Professor Robert Shiller: I’m sorry? Professor Robert Shiller: Oh, did I do with–yes, I’m sorry, that’s 7% of 170 million. You don’t actually have to hold this buffer, but it limits you if you don’t. And so practically, most banks will. So then, you go to look on your balance sheet, and you see, hey, we’re lucky, we have got 12.9 million. Let’s say, I just made that up, all right? How do you get common equity? You take the total assets in your balance sheet, you subtract off all of the liabilities, all the money you owed. And that gives you shareholders’ equity, but that has two components, common equity and preferred equity, so you’ve got to subtract off the preferred equity. But it’s a sense of how much extra resources you have. After you’ve paid off all your debts, you still have $12.9 million. You say, hey, we’re good. We’ve got an extra million dollars, OK? So then, you bring that up at the board meeting and say, we’re satisfying Basel III, isn’t that great? But someone at the board might say, but wait a minute, that means we have $1 million too much. It’s just sitting there, we’re not even using it. Let’s lend it out. I’m sorry, let’s use it up, not lend it out. How do you use it up? You’ve now got more than the amount of capital required. You’ve got another million dollars. You could lend out $1 million, but think about it. You can borrow more and lend more. Or you can borrow more and take other assets. And you can go beyond $1 million. Let’s consider this. So, do you understand the situation? That we’ve done our accounting. We have 170 million in risk-weighted assets. We have a requirement, therefore, of 11.9 million in common equity. We have an extra million dollars. Let’s consider buying different kinds of assets. How about buying Fannie Mae bonds, all right? How much more can you buy? Well, you’ve got $1 million. If you’re going to buy more, you’re going to add both assets and liability. You’re going to borrow money, and you’re going to buy more. So, you’re going to add both assets and liabilities to your balance sheet. How far can you go without violating the capital requirement? Well, the amount you can buy of Fannie and Freddie bonds is $1,000,000/.2-.07. And that’s about $70 million worth of Fannie and Freddie bonds. Because you add that to this mix, then it will raise your risk-weighted assets by exactly $1 million. So, you can buy $70 million of Fannie and Freddie bonds according to this weighted asset calculation. You see that? Well, how about making loans to small businesses in our community? Well, that’s 100% risk-weighting. So that means, I can make loans of $1,000,000/.07, and that’s about 14 million. So, this is what you would tell. You’re at a board meeting and you’re saying, let’s consider that. We’re going to stay within the requirements, we can buy 70 million of Fannie bonds, or we can make 14 million more in loans. But at the board meeting, someone might say, you know, 70 million sounds better than 14 million, I think we should do Fannie bonds, and tell all the guys with small businesses coming by, tough luck. You know, we don’t have any money for you. So, we see what it’s doing. Its pushing people–the Basel requirements, and these are Basel II, or Basel I requirements, we’re pushing banks toward investing in subprime loans issued by Fannie Mae as against lending to businesses. And people are starting to wonder about that now. But you have to say, isn’t the prosperity of the country determined by the businesses? When you’re making a subprime loan, what is a subprime loan? It’s a loan to someone with bad credit, who’s bad employment history, to buy a house. So, we have created an incentive for banks to lend to those people rather than to businesses. And so there are critics of Basel, all the Basel agreements, saying, it’s counterproductive. We shouldn’t have done this. These weights were wrong. There shouldn’t have been so little risk-weighting on Fannie Mae. But then, the Basel people would say, look, we can’t get it exactly right. We thought Fannie and Freddie–and we’re right, they haven’t failed. Our job at Basel is to prevent a run on the banks, so we want banks to be sound. And maybe you’re right, maybe businesses should be encouraged, but it’s not our department. We’re trying to prevent bank failure. So, these rules stick, and they’re still with us today under Basel III. If you want to subsidize small businesses, countries like in the United States we have the Small Business Administration, that gives loans to small businesses. But Basel III is not going to do that. So, I said I would talk about other financial crises, and let me talk briefly about a few, and then I’m going to have to wrap up. The crisis that we have been through was a worldwide crisis, starting in 2007, peaking in 2008 and 2009. And it caused a worldwide recession. So, it’s especially vivid in our memory. But I want to just reflect that these crises–we’ve had banking crises so many times in history that it’s not a unique event. And I just wanted to remind ourselves of a few other crises. I’m going to start with the Mexican crisis, our neighbor to the south, of 1994-5. Under President Salinas, the government privatized Mexican banks. Salinas was a Harvard-educated economist who wanted to modernize the Mexican economy. And they privatized the government banks, and turned it over to the free market, and they forgot to regulate it. And so, it led to a bank-lending boom. In 1988, lending was 10% of GDP. 1994, up to 40% of GDP. Salinas did not stop this. And it led to a boom in Mexico, because lending was going wild, everything was happening really fast, and it led to a bubble and a boom in Mexico. And there should have been a regulator who said, stop it, anyway. But there wasn’t effective regulation, because Mexico had deregulated but it hadn’t set up the banking institution, the regulatory institution. So, it developed an atmosphere in Mexico that, you know, I don’t worry about the possible crisis, because the Mexican government will bail everybody out. And, you know, they couldn’t bail everyone out, it turns out, there was a collapse. So, Salinas was replaced by Yale-educated Ernesto Zedillo. I shouldn’t put it that way. And the Mexican banking system was destroyed by this crisis. And what ended up happening is that most Mexican banks were taken over by foreign banks. And it was followed by an economy that was heavily damaged by a crisis. But Mexico recovered. And 1994 and 1995 was unique to that country. It was a terrible recession that hit Mexico briefly. That’s one example. But again, it was a regulatory failure that did it. If you allow the moral hazard to develop, if you allow people to think that, hey, let’s make all these loans. I think it’ll work out, but maybe it won’t, and if it doesn’t, hey, we have friends in Mexico City, so we’ll all be all right. The next example is the Asian crisis of 1997. It’s a very complicated crisis involving a number of Asian countries, but it was heavily related to bank lending. And international banks had lent a lot of money to Asian countries. And the countries then had loans that were–they were dependent on loans–that were withdrawn when a sort of a bank run occurred. It was something like a bank run, because the international investors suddenly wanted to withdraw their money from the Asian countries. And the Asian crisis started in Thailand, and Korea, and Indonesia, and then it spread all over the world. It reached Russia as a consequence, and it’s called the Russian Debt Crisis. It was a contagion effect. And it got all the way down to Brazil. You wonder, why was Brazil affected by an Asian crisis? Well, the world, it was and is interlinked. So, it’s experiences like this, that encourages the G-20 countries now to agree on bank regulation, that will prevent this kind of collapse. And the last example I have is, again, it’s not–this one is not so international. The Argentine crisis of 2002. This was, again, a complicated crisis. But it involved the Argentine government shutting down the banking system in Argentina. And I don’t have much time to talk about all this. The examples that I gave of crises around the world, I went through them very quickly, but let me just reiterate the themes that I started out with. And that is that banks fill a fundamental role in our economy. They make things work. They solve moral hazard problems. They solve adverse selection problems. They create liquidity, so that businesses can function and individuals can function. When the crisis develops, we suddenly realize the importance of our banking system in its absence or in its poor behavior. And so, I think there’s an attitude among a lot of people that they don’t like regulators, or they don’t appreciate regulators. But in fact regulators are people who are managing a very complicated system, which is really important to our prosperity. If you look at causes of economic disruptions, it’s failures in our banking system that seem often to be responsible. There’s other things, like, for example, an oil crisis can bring on a–it seems to be completely independent of a banking crisis, but you take those two together and you explain most economic crises. It’s a very important thing to get banks regulated right. Now what I didn’t talk about in this lecture is–I’m going to come back to this–is the shadow banking system. Let me just mention this in anticipation. And that refers to other kinds of companies, not officially banks, that are doing business that resembles banking and is not regulated. So for example, Lehman Brothers or Bear Stearns, which were major failures that led to this crisis, they were not banks. Well, they’re not commercial banks. They’re not under Basel III. They are investment banks, which is different animal and it’s not regulated by Basel III. Let me add innovation in finance. It’s making the financial world harder and harder to understand. That’s why we keep having Basel I, Basel II, Basel III. There’s going to be a Basel IV. Financial systems are so much more complicated than they were, say, in the 19th century. There used to be a bank. You can see, there’s one downtown New Haven that looks like a Greek temple. You probably didn’t even notice it. I looked at the corner stone. It was 19th century. It’s a beautiful old building. Banks were like that. They had a nice granite edifice. You’d go in and there’d be a banker sitting there. And you could talk to a person, and they’d make a loan. But now, we have all these complicated derivative contracts, and they trade all over the world, it’s so interconnected. And shadow banking, which I’ll come back to later, shadow banking is a consequence of–it’s the kind of thing that happens. Regulators can’t keep up with all these innovations. But I don’t think the answer is to shut down innovation. We just have to allocate resources, and that’s a trend that we are doing. And I think that we will benefit, if we have effective and sound regulation that takes into account the subtleties of moral hazard, adverse selection, the importance of liquidity. These are basic, important concepts that make for better lives for people. And we have to expect that regulation is going to get complex. Basel III may look complex. It’s going to get even more complex, but we’ll have computers managing the regulations somewhat, so it’ll all be doable. OK. I’ll see you again. I hope you have a nice spring vacation.